Future design graduates will need to be both artist and scientist, able to understand and apply the latest technology alongside the creative process. This practical programme allows you to develop strong creative design capabilities as well as scientific and engineering knowledge and skills. The programme is built around the core Design Studio modules – tutorial-style sessions where you are encouraged to think and develop as an independent designer, supported by visiting professionals. Throughout the second and third years you’ll be working on individual and group projects. The final-year group project, in which students work for a client in industry, has generated several patent applications. All final-year projects are presented at the Queen Mary Design Show. 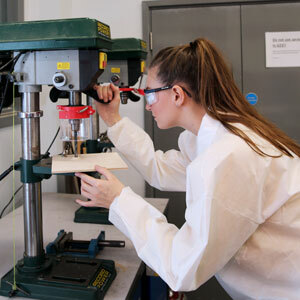 If you choose the MEng degree you’ll carry out a further ambitious individual project in the fourth year, experiencing product development from inception to realisation. You’ll also take engineering and materials modules that provide background knowledge for the project. Design, Innovation and Creative Engineering is a unique course. You’re allowed to develop in your own way and engage in projects outside the curriculum. Visiting museums as part of the programme was brilliant because we can immerse ourselves in the world of design.